FM broadcast. First show with Ken Coomer on drums and Max Johnston on various instruments. 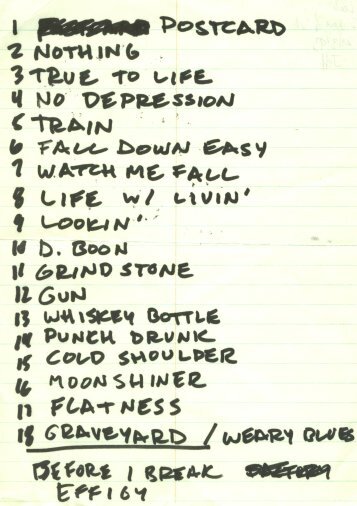 "Moonshiner" from this show was released on Live from Mountain Stage, Vol. 7. Set opened with "Grindstone," there were approximately 40 people in attendance (thanks to Jim for the information). Audience recording. 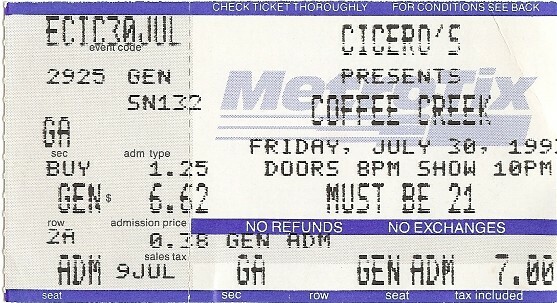 The set included the first known version of CCR's "Effigy," and a great thrashy cover of ZZ Top's "Heard it On the X." Note that the bootleg "Halls of Shame" that claims to be from this date is actually the radio broadcast from Lounge Ax, 3/24/94. Here's a preview from the Rocky Mountain News. Audience recording. Freedy Johnston and Digby opened. A lunch-time show on campus. Freedy Johnston and The Trouble Dolls opened. 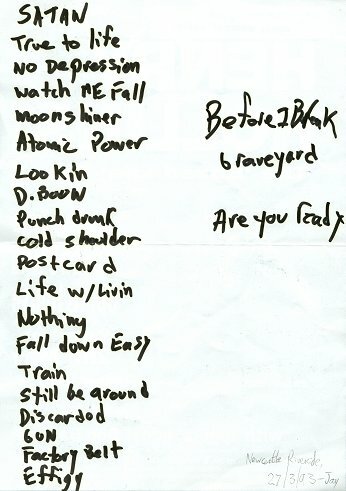 Atomic Power/ Grindstone/ Watch Me Fall/ Moonshiner/ True To Life/ Satan, Your Kingdom Must Come Down/ Life Worth Livin'/ Postcard/ Nothing/ Discarded/ Fall Down Easy/ Flatness/ Wipe The Clock/ D. Boon/ Punch Drunk/ Cold Shoulder/ Graveyard Shift/ Sleeping Room (Henneman vocals)/ Gun/ Still Be Around/ Factory Belt/ Looking For A Way Out/ No Depression/ Effigy/ Is Anybody Going To San Antone? Audience recording, also on video (click on the hyperlinks above to watch clips on Youtube). Audience recording. Acoustic set opening for Johnny Cash. Grindstone (cuts in)/ Watch Me Fall/ No Depression/ True to Life/ Satan, Your Kingdom Must Come Down/ Life Worth Livin'/ Looking For a Way Out/ D.Boon/ Fall Down Easy/ Flatness/ Wipe the Clock/ Nothing/ Postcard/ Cold Shoulder/ Graveyard Shift/ Gun/ Still Be Around/ Train/ Factory Belt/ Effigy/ Whiskey Bottle/ Heard it on the X/ Before I Break/ (Is Anybody Going to) San Antone? Audience recording. Great set, with the last known recorded performances of many songs (D. Boon, Fall Down Easy, Flatness, Wipe the Clock, Cold Shoulder, Graveyard Shift, Train, Factory Belt, Before I Break). 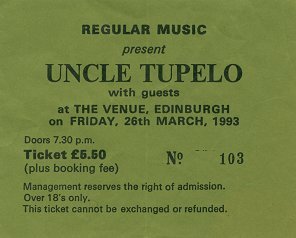 Show might have been on 3/25/93. 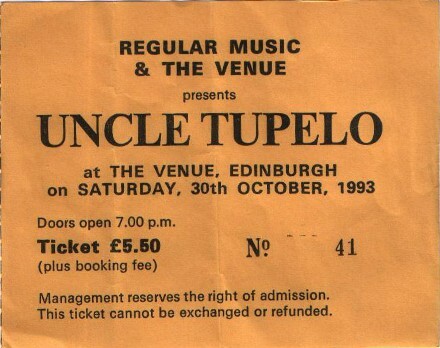 One fan recalls that there were an enthusiastic 80-100 people in this 200-capacity venue. Satan, Your Kingdom Must Come Down/ True to Life/ No Depression/ Watch Me Fall/ Moonshiner/ Atomic Power/ Lookin' for a Way Out/ D. Boon/ Punch Drunk/ Cold Shoulder/ Postcard/ Life Worth Livin'/ Nothing/ Fall Down Easy/ Train/ Still Be Around/ Discarded/ Gun/ Factory Belt/ Effigy/ Before I Break/ Graveyard Shift/ Are You Ready for the Country? London band Soul Green opened. Approximately 80-100 fans in attendance. There is no known audio of this show. 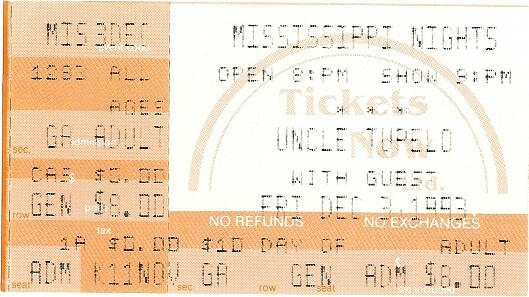 This show may have been cancelled due to low ticket sales. The last show of a brief UK tour. Greg Kot's book on Wilco mentions that Ken Coomer was very sick with food poisoning, but played the show after Jay Farrar insisted they play a full-band electric set. Jeff and either Jay or Mike joined the Jayhawks for their encore. 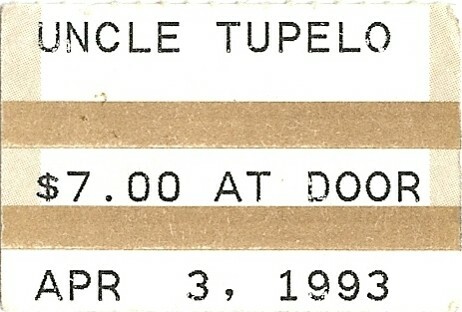 From the St. Louis Post-Dispatch on 4/29/93: "For the encore section, the Jayhawks came back on stage with two members of Uncle Tupelo, local favorites who are poised to embark on major label status. The bands have played together several times before at Cicero's, and Olsen seemed genuinely happy to have his guests join them for three good-natured countrified romps." 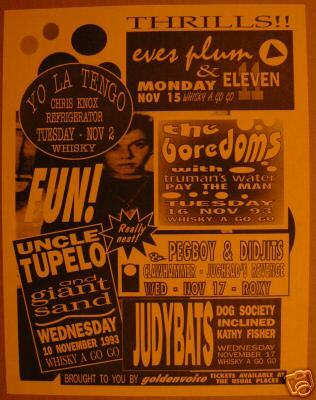 The Bottle Rockets opened this show. Audience recording. Only known version of Skip Spence's "Little Hands." Soundboard recording. Part of this show was broadcast on a local radio station. There is also an audience recording of this show. According to one eye-witness, the club was filled with Norweigian Hell's Angels (thanks to Jonathon for the information and pictures). Grindstone/ Satan, Your Kingdom Must Come Down/ True to Life/ Chickamauga/ Watch Me Fall/ Anodyne/ Long Cut/ Slate/ Atomic Power/ Looking For a Way Out/ Nothing/ New Madrid/ Sandusky/ Acuff Rose/ Steal the Crumbs/ Fifteen Keys/ We've Been Had/ Give Back the Key to My Heart/ Moonshiner/ Willin'/ (Is Anybody Going To) San Antone? Soundboard recording. This show featured a beautiful arrangement of "Moonshiner" with lots of fiddle from Max. First night of a two night stand for Coffee Creek. Here's a review from the St. Louis Post-Dispatch. Soundboard recording. 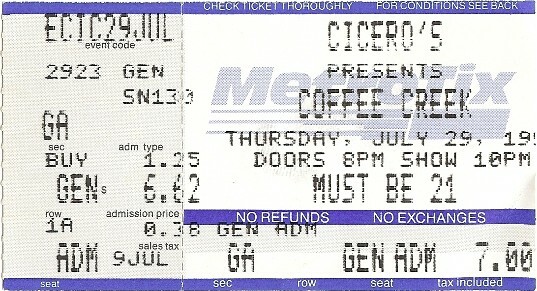 The fourth and final Coffee Creek show. The tape of this show in circulation for years was not complete (ended after "Truck Drivin' Man"), but a different source containing the complete second set has been found. Soundboard and audience recordings. The soundboard tape was previously listed as "07/? ?/93, Somewhere in Europe." Grindstone/ Satan, Your Kingdom must Come Down/ True to Life/ Chickamagua/ Watch Me Fall/ Anodyne/ We've Been Had/ Give Back the Key to My Heart/ Slate/ Atomic Power/ New Madrid/ Sandusky/ No Depresion/ Steal the Crumbs/ Acuff Rose/ Fifteen Keys/ The Long Cut/ Looking for a Way Out/ Willing/ Suzy Q/ Is Anybody Going to San Antone? Everybody Knows This is Nowhere (soundcheck)/ Willin' (soundcheck) / Grindstone/ Satan, Your Kindgom Must Come Down/ True to Life/ Chickamauga/ Watch Me Fall/ Anodyne/ We've Been Had/ Give Back the Key to My Heart/ Slate/ Atomic Power/ New Madrid/ Sandusky/ No Depression/ Steal the Crumbs/ Acuff-Rose/ Fifteen Keys/ The Long Cut/ Looking For a Way Out/ Willin'/ Is Anybody Going to San Antone? Soundboard recording. Bottle Rockets and Stumptwhoopt opened. Soundboard recording. This show was recorded by radio station WXRT but was never broadcast. The songs with an * appear on The Long Cut + Five Live promo CD. There is also a very good audience recording of this show. 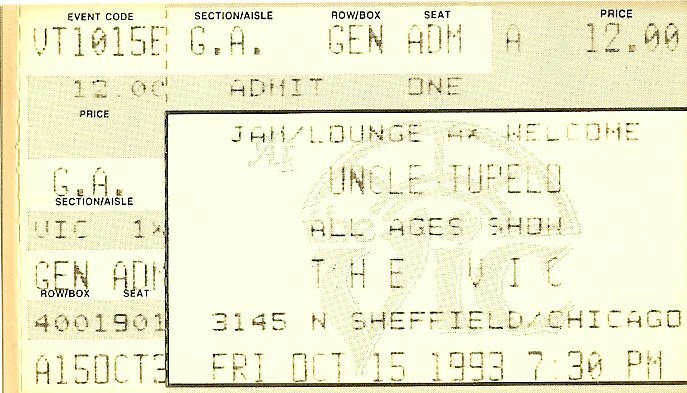 Greg Kot from the Chicago Tribune: "At the Vic, Uncle Tupelo benefitted from an expanded lineup. At their most earnest and hard-rocking, bassist Jeff Tweedy and guitarist Jay Farrar come across like a heartland cliche, but two multi-instrumentalists and a new drummer now underscore the beauty of their melodies. Max Johnston's banjo, fiddle and mandolin especially brought out the country plaintiveness of tunes such as "Give Back the Key to My Heart." 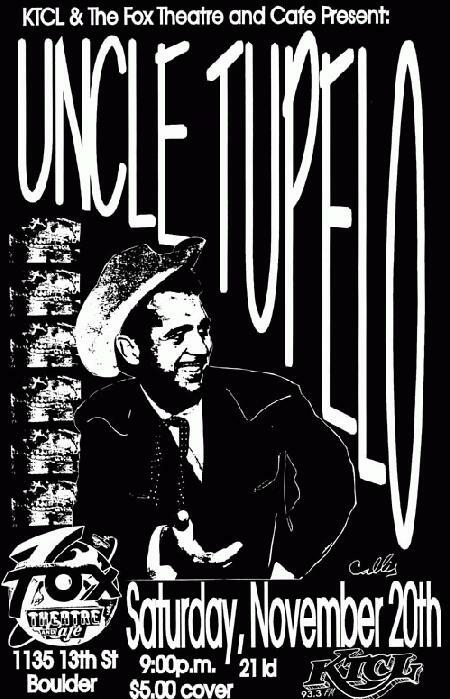 A sense of humor would help, but failing that, Uncle Tupelo's tales of rust-belt burn-out sound more at home than ever in the land of Gram Parsons, Neil Young and the Jayhawks." Audience recording, the circulating master tape of this show only includes the second half of the show. Previously listed as 3/26/93 and 10/29/93 (I think I have it right this time, thanks to Norrie McCulloch for the clarification). A preview from the Dallas Morning News. Audience recording, existing tape has many flaws. Giant Sand and the Chainsaw Kittens opened. Here's a preview from the Austin American-Statesman. Audience recording. Giant Sand opened. A review from the Press Telegram. Soundboard recording, most of this show was later broadcast on a local radio station. Audience recording. 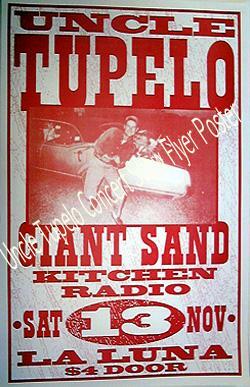 Opening bands were Giant Sand and Kitchen Radio. Soundboard recording. The Bottle Rockets opened. A preview from the St. Louis Post-Dispatch: "The Tupelo engine roars on, with the group's new album, "Anodyne," receiving lots of praise nationwide. The lads from Belleville will make a triumphant homecoming, accompanied on Friday by the equally deserving Bottle Rockets (from Festus-Crystal City) and on Saturday by Tim Lee (formerly of the Windbreakers, a band that wasn't actually from around St. Louis, though Lee did have relatives here)." And here is a review of the show. 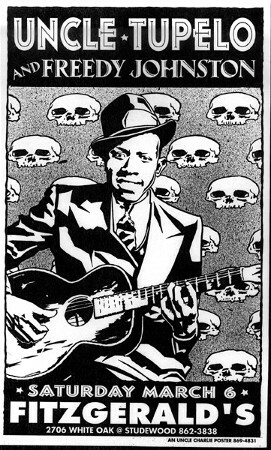 Set included the last known performance of "Cortez the Killer" with Brian Henneman on lead guitar. Tim Lee opened. Audience recording. A preview from Boston Herald. Soundboard recording. 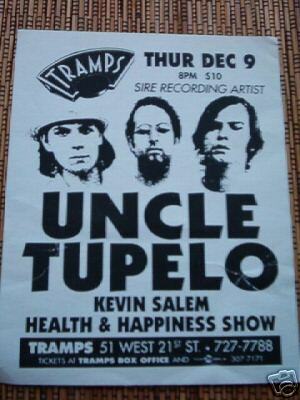 Part of the CMJ festival, with Kevin Salem and the Health and Happiness Show. 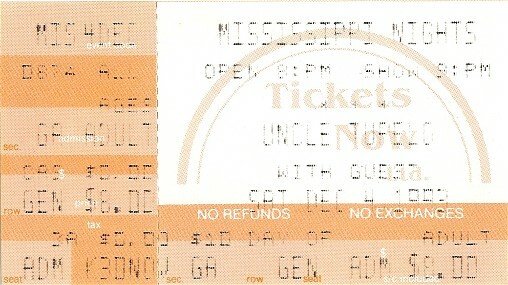 Last known performance of "Criminals" until Jay Farrar's 2001 tour. Tony Margherita mentioned in the liner notes to Anthology that this show got a rave review in the New York Times, though he may have been referring to this preview of the show at Maxwell's the next night.